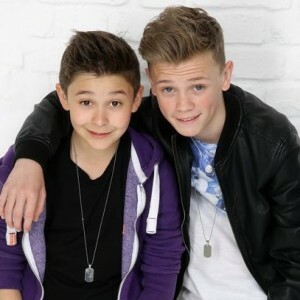 Bars and Melody (B.A.M) are a British singing/rapping duo consisting of rapper Leondre Devries (“Bars”) and singer Charlie Lenehan (“Melody”). They took part in the eighth series of Britain’s Got Talent in 2014. During their audition, they had automatically been entered into the semi-finals of Britain’s Got Talent after head judge Simon Cowell pressed the “golden buzzer”, a new feature introduced in the eighth series, and finished in third place. After the show, Bars and Melody signed a record deal with Syco Music. Their debut single “Hopeful” was released on 27 July 2014 . They both decided to call their new fans Bambinos. On 8 February 2014, Bars and Melody auditioned in Manchester for the eighth series of Britain’s Got Talent. They performed a song based on Twista and Faith Evans’ “Hope”, with Devries replacing the original verses with ones protesting against bullying. After the audition, the audience began chanting “Push the gold!”. Bars & Melody received the golden buzzer from Simon Cowell and went straight through to the live semi-finals. Their audition has been viewed on YouTube more than 50 million times. Before the semi-finals, they were interviewed on The Ellen DeGeneres Show in the United States, and numerous adverts were posted on Facebook. They advertised Britain’s Got Talent and themselves, as well as performing their audition piece. In the semi-final on 29 May, they performed Puff Daddy and Faith Evans’ “I’ll Be Missing You”, coupled with new verses about someone who had recently lost a friend; audience members having been given candles to wave during their performance. They won their semi-final and progressed through to the final. In the final, they performed the song they sang in their first audition. They came in third place behind Lucy Kay and Collabro after receiving 14.3% of the final vote.